Brabantia is going for purple, as its latest trendy colourway, for their Get Together tableware, as well as coloured kitchen bins and corkscrews – they feel that there’s something deeply reassuring about the colour, a hue that exudes luxury, quality and success. Or possibly it’s the warmth it produces that is so appealing, especially in the depths of winter when it’s cold and wet outside. Purple is proving to be an extremely popular interiors look right now, so Brabantia has introduced the colour to a number of products in its collection this season. 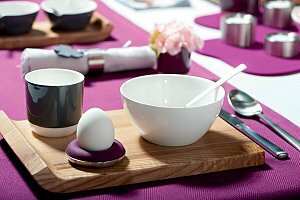 Brabantia has announced the launch of a wide-ranging tabletop collection of contemporary porcelain, textiles, cutlery and accessories for casual dining. Sharing a meal together is a central part of family life, and eating with friends is a great way to further expand friendships. Not only the quality of the food and drink you provide, but also the ambience you create around the table is important for success. By creating ‘Get Together’ – one of the most comprehensive collections of porcelain, textiles, cutlery and accessories – Brabantia has made it easy for you to convey your individuality. Searching to discover what your kitchen storage jars and canisters contain is a tiresome job, especially when you’re in a rush, or they have been put back in the wrong place. 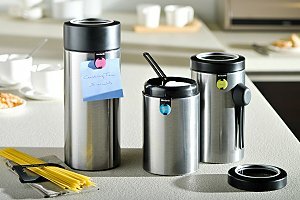 A new range of canisters have been introduced by Brabantia, combining a see-through window in the lid and a clever labeling system that you can adapt to specify the contents stored: These new canisters can either be placed in a handy kitchen drawer – so that you can easily recognize the contents and quantity on hand – or they can look great on a shelf or worktop. Three sizes are offered – 1.4, 1.7 and 2.2 litres – for storing all of your baking, cookery and beverage supplies, from flour, pasta and pulses to sugar, tea and coffee. The window lid has an aroma-tight ‘click’ seal that keeps the aroma in and moisture out, as well as keeping the contents fresh. The containers are made from stylish matt brushed stainless steel coated with Brabantia’s fingerprint proof finish, while the lids are in contrasting matt black. 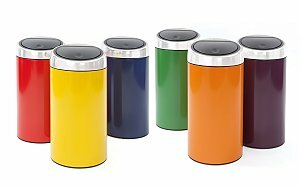 All canisters have a simple personal labelling system that includes a multifunction clip with coloured pre-printed and blank labels. You can even add your own notes to the labels to indicate expiry dates, cooking times or instructions for other family members. The 1.4 and 1.7 litre canisters have a handy magnetic measuring spoon attached to the side, while the 2.2 litre one has a magnetic spaghetti measure, to help you estimate the amount required for each serving. The containers have a 10-year guarantee and retail at around £11.80 for the 1.4 litre size, £13.60 for the 1.7 litre and £15.70 for the 2.2 litre canister. Whatever the recipe says, it’s always easier when your spices and herbs are ready to hand. 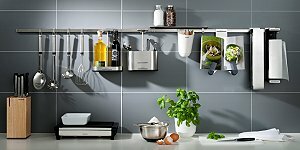 Now thanks to the addition of a Herb rack to Brabantia’s flexible Kitchen Today wall-rail system, they can be right in front of you. The new Herb rack comes with five glass jars, each fitted with a flavour-tight seal, to keep your herbs and spices fresh for longer. “Whatever your style – we will match it!” That is the promise behind Brabantia’s highly innovative bespoke ‘Colour Your Bin’ personalisation service. Offering homeowners the choice of over 200 colours on its 45 litre Touch Bin®, through an all-new colour matching service was quite a radical move, and now the brand is taking six of the most popular colours and making them available within its retail range. In an extension to its product collection, Brabantia has introduced an all-new Knife block, to complement its line-up of kitchen knives. 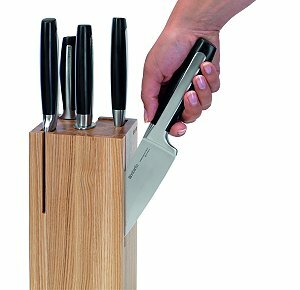 The Knife block has been specially designed to store Brabantia’s five-piece knife set, including the sharpening steel, in a compact and secure way, and to suit either a classic or modern-look kitchen. Whereas most traditional knife blocks are static and follow the same basic design, this new product from Brabantia is made from sustainably sourced Ash, and boasts a more contemporary design with beautifully engineered vertical side slots, each dedicated to a specific item. Not everyone’s Jamie Oliver in the kitchen and a clean organized kitchen may be the ideal but sometimes we do struggle, stirring the soup, cutting the bread, opening that wretched pickle jar whilst balancing a phone between the chin and shoulder! Co-operative Xest offer timeless products that will make you wonder how you ever did without, to save you not only time and energy but also to make those kitchen moments a little less tedious. 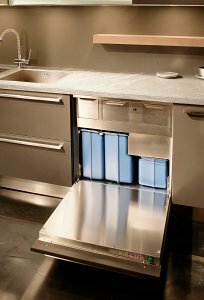 The iSmart No-Touch waste bin will become the focus of your kitchen; it may even get the kids to tidy up after themselves, as they’ll love the automatically opening and closing lid. Genius! 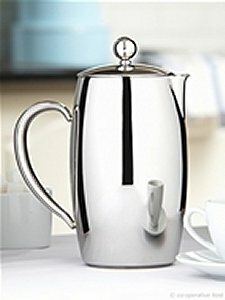 From £89.88. Managing your domestic waste and separating everything for recycling isn’t everyone’s idea of fun, but in our increasingly environmentally conscious world, it is a domestic task that’s taking on much greater importance. Because the needs of each person and their local authority vary so much, Brabantia provides a range of products to help people design their own waste management and separation system, while also enabling them to complete the job quickly, effortlessly – and in style. The new Brabantia Twin bin in our picture has two 20lt bucket liners for easy waste separation in the kitchen; it is available in either brilliant steel or matt brushed steel finish and comes with a 10 year guarantee. 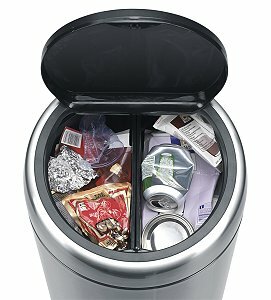 The pioneering Sovereign Eco-Bin Waste Manager is an all-in-one, three-way waste management system that disposes of food waste and separately compacts cans and plastic bottles. 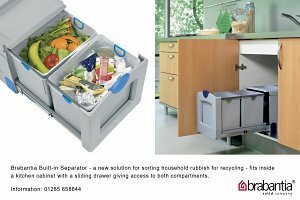 Brabantia has introduced two new kitchen accessories to make waste collection and recycling simplicity itself. Take the hassle out of sorting your household rubbish for recycling, with Brabantia’s built-in separator with two compartments for different items such as bottles, cans, packaging or organic waste.